There was a time when WFAN host Craig Carton of the show "Boomer & Carton" was one of the most prominent skeptics of the Nets' move to Brooklyn. But that came before the high-paid Carton made his own deals with the Barclays Center, then misappropriated investors' money to pay off gambling debt, and then lost his job and now his freedom. Let's recap. 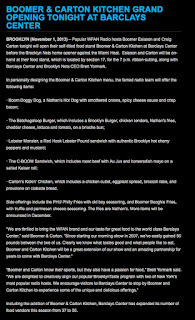 As I wrote in December 2008, Carton had a scrappy interchange with Brett Yormark, then CEO of the New Jersey Nets, who was promising a move soon to Brooklyn. While, in retrospect, Carton was wrong in asserting, "You're not moving to Brooklyn," he did get Yormark to say he was "convinced" that the Nets would be in Brooklyn "for the 11-12 season." At the time, I wrote that 2012 was a more realistic best-case scenario, and that's how it turned out. When Carton suggested the Nets move to the Prudential Center in Newark in the interim, Yormark pooh-pooh'ed that, saying the Nets preferred the Izod Center. Indeed, the Nets moved to the Pru for two years. Carton wasn't always reliable, claiming, "I've been told as a fact that you have accepted a job to go work for the Miami Dolphins." Yormark said no, and he was right. In October 2012, Carton was an instant skeptic of Yormark's aim to hold the Brooklyn Nets opener as scheduled, despite the fact that Superstorm Sandy knocked out subway service: "I gotta tell you, this game should not be played." Co-host Boomer Esiason, a Long Island resident, also pushed back. And after Mayor Mike Bloomberg reversed himself and stopped the game, Yormark sounded sheepish on Boomer & Carton. 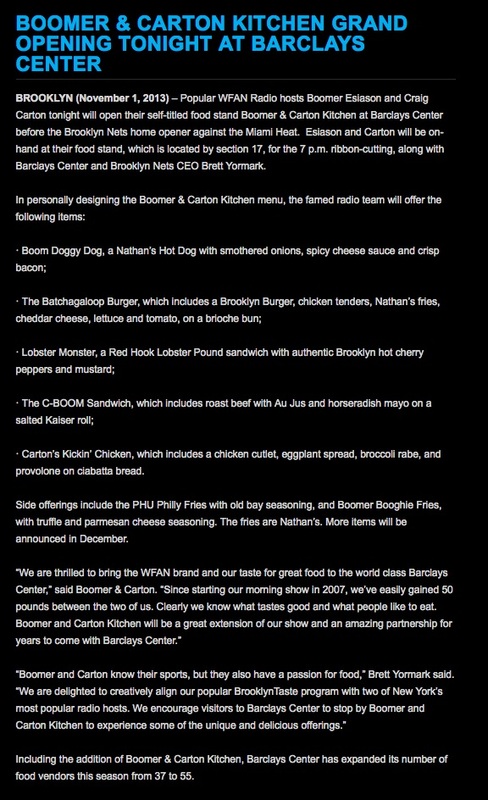 On 9/6/17, when federal securities fraud and wire fraud charges were revealed against Carton, alleged to misappropriate millions in a ticket-selling scam to pay gambling debts, I wondered how long it would be for the Barclays Center to give up on the Boomer & Carton Kitchen. As I wrote, it was not long at all--though Barclays managers told Newsday that they had already decided not to renew the food stand. Who knows. And former collaborators testified against Yormark at the trial. As Newsday reported 10/31/18, Yormark said Carton never got his signature on a purported contract for bulk ticket sales that the radio host used to convince a hedge fund to invest in his ticket resale business, money instead used for gambling. But the arena did make nice to Carton, surely wanting to maintain a good relationship. In 2015, Mangione testified, Barclay’s briefly had an agreement allowing Carton and Meli to promote events on “dark nights” at the arena, but Barclays ended it, telling Carton that Meli had a bad reputation as a guy who “didn’t deliver” on promises. With Carton not testifying, the case moved quickly. As Newsday reported 11/5/18, prosecutors rested their case at the start of the second week of trial. In closing arguments, as Newsday reported 11/6/18, Carton's defense lawyer claimed he "never intended to steal anyone’s money.” Prosecutors pointed to the fake emails and agreements. Gottlieb also told jurors that Brooklyn Sports and Entertainment, the arenas' operator, had cultivated Carton for years by giving him smaller deals to resell tickets — a claim Carton made before trial — and executives led him to believe the deals he pitched to Brigade would come to pass. Gottlieb said CEO Brett Yormark and former chief of staff Fred Mangione misled jurors by downplaying those ties in testimony because they were embarrassed to admit giving a middleman a block of tickets to sell at higher prices to the public. “It would sully Barclays' reputation,” he said. It's, well, interesting, that they would give a middleman tickets to sell at a premium rather than a discount--presumably just for in-demand events. The guilty verdict, Newsday reported 11/7/18, came quickly, on the second day of deliberations. Carton will appeal. The New York Post's Lia Eustachewich wrote The rise and sad fall of Craig Carton, citing some of Carton's outrageous history. Columnist Andrew Marchand penned Craig Carton’s sad fall: A radio genius done in by his demons, writing, "But Carton liked to play at the edge, and he liked to play dirty. He was the type of host who would do touchdown dances on others’ graves. Nothing was off-limits." Indeed, and this is kind of amazing, Marchand noted that, in contrast with the usual seven-second delay system, to bleep out unexpected profanity or other untoward remarks, WFAN had a "an extra-special delay system" to "protect the station and Carton from himself." New York Daily News columnist Bob Raissman, writing 11/8/18, noted that Carton never testified: "How ironic that in the fight of his life, Craig Carton could not use his most lethal weapon — his mouth." And that Carton was given a long leash by enthralled fans and program directors happy to collect ratings. As the Daily News reported 11/8/18, former partner Esiason, speaking on the air after the verdict, said he was "saddened" and observed, "For anybody out there who's ever had anybody in their life who has dealt with any sort of addiction — drugs, alcohol, gambling — this is a cautionary tale of how your life can spiral out of control."